FertilAid® was formulated on the basis of established scientific literature to help optimize fertility safely and naturally in both Women’s and Men’s Formulas. Created by fertility expert Amos Grunebaum, MD, FertilAid is the natural – and trusted choice – in fertility supplements. How Many FertilAid Value Packs Should I Purchase? For women, it takes up to three months for the fertility-enhancing herbal ingredients in FertilAid to exert their full effect on your reproductive system. For men, because it takes 2-3 months for sperm to mature, FertilAid for Men must be taken for at least this period of time to begin to see positive effects in terms of sperm count, motility, and morphology. For these reasons, to ensure best possible results, we recommend purchasing a 3 month supply of FertilAid for both Women and Men. The largest discount we offer is applied to purchases of 3 FertilAid Value Packs. What is the Recommended Dosage of FertilAid for Men? Recommended Use: As a dietary supplement, take 3 capsules daily, ideally in divided doses with meals. Benefits of herbal properties may require as long as three months to achieve maximum effect. Take daily as benefits may be mitigated by sporadic use. Are There Any Safety Guidelines with FertilAid or Contraindications? FertilAid is an herbal-nutritional supplement and not a drug. Anyone with a pre-existing medical condition should consult a physician before taking FertilAid (or any supplement). And as with any supplement, please keep out of the reach of children. How Long Should I Take FertilAid? The makers of FertilAid for Men recommend that you take FertilAid for 6 months or until successful conception – or as long as you wish to maintain optimum sperm quality and increased reproductive health. Additionally, supplements rich in vitamins and antioxidants play a vital role in general health as well. What are the Results of the FertilAid for Men Clinical Study? Data from an independent, placebo-controlled, gold standard clinical study indicates that the use of the supplement, FertilAid for Men, resulted in increased male fertility and sperm health. Specifically, the results of this important study reveal that taking FertilAid for Men significantly increases total normal sperm motility – with a tendency toward an increase in total mobile sperm count. Conducted by reproductive endocrinologist, Dr. J.E. Ellington, and pharmacologist, Dr. G.D. Clifton, the randomized, double-blind FertilAid for Men study was conducted through 2006 over a three month period to determine the effects of FertilAid on men with ‘abnormal sperm parameters, as defined by the World Health Organization. The results of the FertilAid study revealed a significant improvement in the number of motile sperm, or total normal sperm motility. According to Dr. J.E. Ellington, men with higher levels of motile, normally shaped sperm have shown better pregnancy outcomes in several [independent] studies. Read more about this benchmark FertilAid clinical study – and how FertilAid can enhance sperm quality and male fertility health. How Many Bottles of FertilAid for Men Should I Purchase? Because it takes 2-3 months for sperm to mature, FertilAid for Men must be taken for at least this period of time to begin to see positive effects in terms of sperm count, motility, and morphology. For this reason, we recommend purchasing at least a 3 month supply of FertilAid for Men to ensure best results. The maximum discount (10% off) applies to all purchases of 3 bottles or more. How Does FertilAid for Men Work? 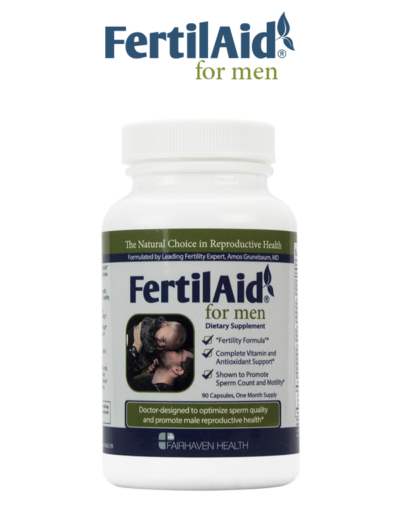 With an all natural, non-prescription formula that brings together herbal ingredients and essential vitamins, FertilAid is designed to promote male reproductive wellness as part of an overall health and diet regimen, supporting fertility and optimizing your chances to conceive. What is the Amino-acid L-Carnitine? L-Carnitine plays a vital role in the process of sperm development, in promoting proper maturation and morphology of sperm, and in ensuring the maintenance of sperm quality and vitality. These are primary issues in male reproductive health – and L-Carnitine addresses many physiological and metabolic factors that can help enhance fertility. FertilAid for Men contains more L-Carnitine than other fertility supplement brands. FertilAid for Men has no known side effects. However, as with any dietary supplement, if you have a pre-existing medical condition, we recommend that you discuss taking FertilAidwith your doctor. Can I Take FertilAid for Men If My Partner is Using Fertility Medication Like Clomid? Yes, men may take FertilAid for Men if their partners are using fertility medication or undergoing IVF procedures. How Long Will It Take to Experience the Benefits of FertilAid? The nutritional benefits of FertilAid may be experienced immediately through comprehensive multivitamin, mineral, and antioxidant support. Benefits of herbal properties will quickly increase over time. Take daily as per instructions (benefits may be mitigated by sporadic use). With FertilAid for Men, the interval for the development and maturation of sperm must also be accounted for: it may take over two months for sperm to mature and to become capable of fertilizing an egg. Does FertilAid Contain Folic Acid to Help Prevent Birth Defects? Yes, Dr. Grunebaum’s FertilAid formula contains 600 mcg of Folic Acid to help prevent birth defects like neural tube defects, spina bifida and cardiac malformations. Dr. Amos Grunebaum is a double-board certified, leading OBGYN and fertility expert. He is the Director of Obstetrics and Chief of Labor & Delivery at one of the top medical university centers in the U.S. and helped to formulate Fairhaven Health products such as FertilAid and FertileCM. Read more about Dr. Grunebaum and our other medical advisors. Should I Take FertilAid When I Am Pregnant? FertilAid for Women is designed as a nutritional-herbal supplement for trying-to-conceive women. It should be used until pregnancy has been confirmed. Upon confirmation of pregnancy, we recommend the use of a prenatal supplement like PeaPod Prenatal. FertilAid was designed by a leading fertility expert – Amos Grunebaum, MD. It is manufactured in the United States by in top-tier, GMP-certified facility. FertilAid is guaranteed for quality and potency. Should I Keep FertilAid Out of the Reach of Children? Yes. All dietary supplements and vitamins should be kept out of the reach of children. Accidental overdose of iron-containing products is a leading cause of fatal poisoning in children. In case of accidental overdose, call a doctor or poison control center immediately. Keep out of the reach of children. Should I Take FertilAid in Conjunction with Vitro Fertilization (IVF) Treatments? Please consult your physician regarding taking FertilAid with any or other fertility treatments. The nutritional benefits of FertilAid may be experienced immediately through comprehensive multivitamin, mineral, and antioxidant support. Benefits of herbal properties will quickly increase over time and may require as long as three months to achieve maximum effect. Take daily (benefits may be mitigated by sporadic use). FertilAid is an herbal-nutritional supplement and not a drug. FertilAid is not recommended for anyone receiving IVF treatments or taking fertility drugs. FertilAid is not recommended for women who are already pregnant, nursing, or believe may be pregnant. Anyone with a pre-existing medical condition should consult a physician before taking FertilAid (or any supplement). Keep out of the reach of children: Accidental overdose of iron-containing products is a leading cause of fatal poisoning in children under 6. Do not use if tamper seal is broken or missing. What Is the Recommended Dosage of FertilAid? Recommended Use: As a dietary supplement, take 3 capsules daily, ideally in divided doses with meals. Discontinue use if you believe you are or may be pregnant. Benefits of herbal properties may require as long as three months to achieve maximum effect. Take daily as benefits may be mitigated by sporadic use. Do not use if you are breastfeeding, pregnant, or suspect you may be pregnant. Do not use if tamper seal is missing or broken. Should I Take FertilAid If I Am Using Fertility Drugs Like Clomid? The potent herbal/nutritional components of FertilAid (extracts of vitex/chasteberry, red clover blossom, siberian ginseng, and ginkgo biloba ) have been carefully selected for their individual roles in promoting reproductive health and supporting hormonal balance. At recommended dosages, no adverse reactions with other food or prescription medications are known. If you are currently taking a prescription fertility medication (such as Clomid), we recommend consulting your physician before taking FertilAid. Why is FertilAid the Right Choice? FertilAid for Women is the only fertility supplement that gently balances scientifically-validated fertility-enhancing nutrients with a Just Right formula of key vitamins, minerals, and antioxidants. Read why FertilAid is quickly becoming a leading ‘fertility-enhancing’ supplement. How Does FertilAid for Women Work? 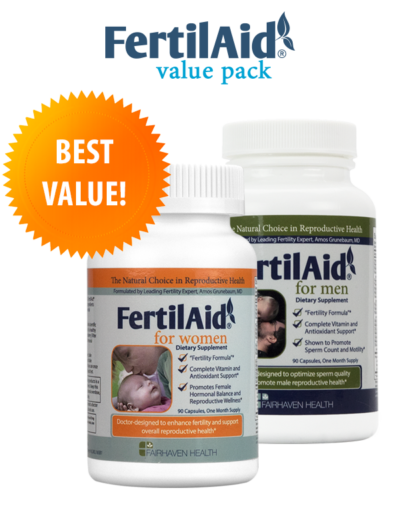 FertilAid for Women is the only fertility supplement that balances scientifically-validated fertility-enhancing nutrients with complete preconceptional multivitamin support. Studies indicate that preconceptional multivitamin support can enhance fertility. The potent herbal/nutritional components of FertilAid (standardized extracts of vitex/chasteberry, red clover blossom, siberian ginseng, and gingko biloba ) have been carefully selected for their individual roles in promoting reproductive health and supporting hormonal balance, as well as supporting the development of reproductive tissues and organs. Can FertilAid Be Taken Together with FertileCM? FertilAid can be taken in conjunction with FertileCM. How Many Bottles of FertilAid for Women Should I Purchase? To ensure that you receive the best possible results, we recommend buying at least a 3 month supply of FertilAid for Women. It takes up to three months for the fertility-enhancing herbal ingredients in FertilAid to exert their full effect on your reproductive system. For this reason, we offer the maximum discount of 10% off for purchases of 3 bottles or more. FertilAid for Women has no known side effects. However, as with any dietary supplement, if you have a pre-existing medical condition, we recommend that you discuss taking FertilAid with your doctor. Additionally, if you are on prescription fertility drugs like clomid, do not take FertilAid for Women (Men may, however, use the men’s formula of FertilAid). What’s The Difference Between FertilAid and Other Fertility Supplements? FertilAid is a doctor-designed supplement that offers a more comprehensive formula then those offered by other products. As you may know, physicians typically recommend taking a prenatal vitamin while trying to conceive. Other supplements make this difficult as they may contain certain components of a prenatal, but omit others. This means that if a woman takes a prenatal in addition to these other supplements she may be doubling up on some ingredients (such as iron) that are not good to take in higher doses. Alternately, if she doesn’t take a prenatal, she misses out on holistic preconceptional nutrition. In contrast, FertilAid takes a two-pronged approach to fertility enhancement: 1) It includes all ingredients of a prenatal vitamin optimized for trying-to-conceive women; and 2) It is an herbal fertility-enhancing supplement that helps to balance hormones and regulate one’s cycle. Our Men’s product is backed by a double-blind, placebo controlled study showing a positive impact on both count and motility. Is FertilAid a Product I Can Trust to Help Us Conceive? Another important difference between us and other companies is our reputation and longevity in the trying-to-conceive community. 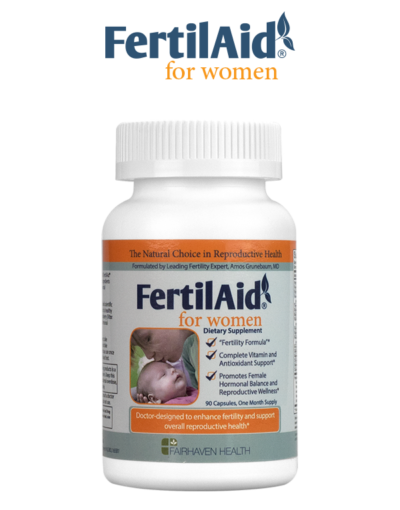 FertilAid and our parent company, Fairhaven Health, have been helping women conceive for years. During this time we’ve seen a number of competitors come and go, many making fantastic claims or quoting statistics without any scientific basis. We’re proud to have one of the nation’s leading fertility experts formulating and advising on our behalf and as the #1 selling fertility supplement we’ve stood the test of time. You can rest assured that any customer testimonials posted on our site are 100% authentic and all product information is validated. Is FertilAid a Prenatal Vitamin? FertilAid contains all the key vitamins and minerals of a prenatal vitamin, including folic acid and essential antioxidants. However, FertilAid is intended for preconceptional use and should not be taken during pregnancy/nursing. Unlike other products, FertilAid offers complete vitamin and antioxidant support – the same critical ingredients in a prenatal vitamin. Studies indicate that preconceptional multivitamin support can enhance fertility. With FertilAid, there is no need to buy an additional prenatal supplement.